New Music USA and the League of American Orchestras have chosen Stacy and the Champaign-Urbana Symphony Orchestra as one of five orchestra/composer pairings for Music Alive’s 2016-2019 residence program. During the residence, Stacy is having performances of her works with the Champaign-Urbana Symphony Orchestra while running several outreach programs for organizations and schools throughout the Champaign-Urbana region. She has also been chosen by Chicago Opera Theater to be the inaugural Emerging Opera Composer of Chicago Opera Theater’s new Vanguard Initiative for 2018-2020, during which she will compose a new chamber opera. Stacy has received numerous awards and grants including the Barlow Prize, Fromm Music Foundation Grant, three Barlow Endowment commissions, Detroit Symphony Orchestra’s Elaine Lebenbom Memorial Award, Boston Choral Ensemble Competition Contest, Utah Arts Festival Composition Competition, Pittsburgh New Music Ensemble’s Harvey Gaul Composition Competition, Raymond and Beverly Sackler Music Composition Prize, Sorel Medallion Choral Composition Competition, and competitions sponsored by the Civic Orchestra of Chicago, Omaha Symphony, and the New England Philharmonic. She has participated in reading session programs sponsored by the American Composers Orchestra and Minnesota Orchestra (the Composers Institute). 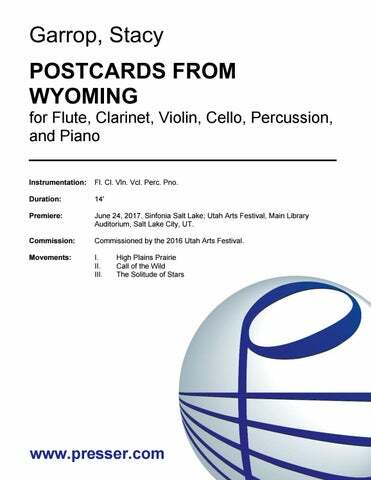 Stacy’s catalog covers a wide range, with works for orchestra, wind ensemble, choir, art song, various sized chamber ensembles (including string quartet, piano trio, and saxophone), and an evening-length oratorio. She has been commissioned and performed by the Albany Symphony, Detroit Symphony Orchestra, and Minnesota Orchestra by Capitol Saxophone Quartet, Gaudete Brass Quintet, and Kronos Quartet; and by Chanticleer, Chicago a cappella, Piedmont East Bay Children’s Chorus, San Francisco Choral Society, and Volti. 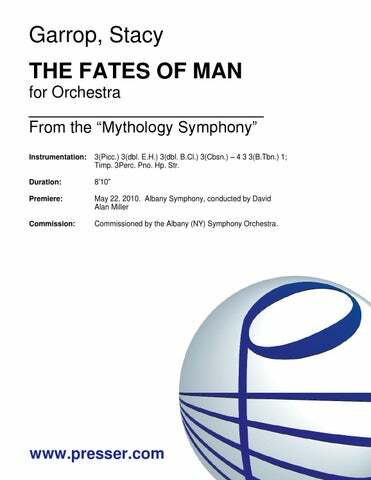 Stacy has previously served as composer-in-residence with the Albany Symphony and Skaneateles Festival, and as well as on faculty of the Fresh Inc Festival (2012-2017). After teaching composition full-time at Roosevelt University from 2000 to 2016, Stacy stepped down from her position to become a freelance composer. Stacy earned degrees in music composition at the University of Michigan-Ann Arbor (B.M. ), University of Chicago (M.A. ), and Indiana University-Bloomington (D.M.). 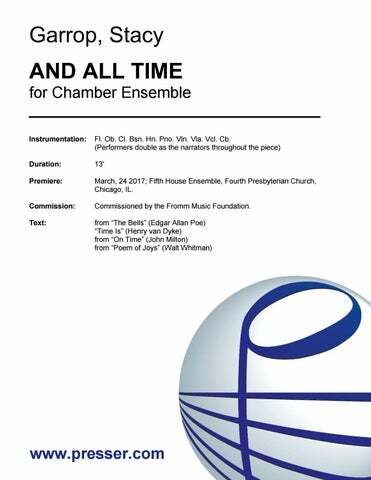 Five Miniatures for Chamber Ensemble 11:00 Fl. Ob. Cl. Vln. Vla. Vcl. Cb. Pno. 7:00 Fl.(dbl. Picc.) Cl. Vln. Vcl. Pno. Perc. (I. From ‘Mythology Symphony’) 14:30 3(2,3 dbl. Picc.) 3 3(B.Cl.) 3 – 4 3 3(B.Tbn.) 1; Timp. 3Perc. Pno. Hp. Str. 4:40 3(dbl. Picc.) 3(dbl. E.H.) 3(dbl. B.Cl.) 3(Cbsn.) – 4 3 3(B.Tbn.) 1; Timp. 3Perc. Pno. Str. 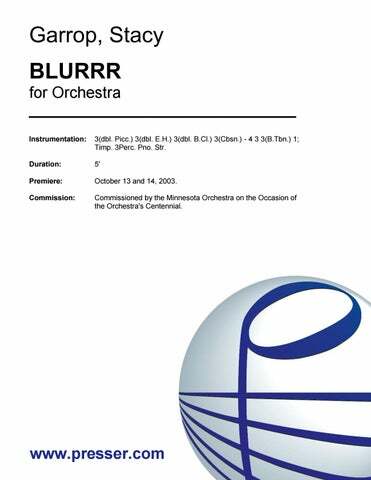 for Full Orchestra 43:00 3 3 3 3 – 4 3 3 1; Timp. 3Perc. Hp. Pno. Str. (V. From ‘Mythology Symphony’) 7:00 3(3 dbl. Picc.) 3(3 dbl. E.H.) 3 3(3 dbl. Cbsn.) – 4 3 3(B.Tbn.) 1; Timp. 3Perc. Pno. Hp. Str. (II. From ‘Mythology Symphony’) 5:50 Mvt. II: 2 2 2 2 – 2 1 1 0; Timp. 2Perc. Hp. Str. (IV. From ‘Mythology Symphony’) 9:50 3(Picc.) 3(dbl. E.H.) 3(dbl. B.Cl.) 3(Cbsn.) – 4 3 3(B.Tbn.) 1; Timp. 3Perc. Pno. Hp. Str. (III. From ‘Mythology Symphony’) 6:10 3 3 3 3 – 4 3 3(B.Tbn.) 1; Timp. 3Perc. Pno. Hp. Str. 12:30 2(Picc.) 2 2 2 – 2 1 2(B.Tbn.) 0; Timp. 2Perc. Pno. Str. An Oratorio 1:14:00 Sop., Mezzo-sop., Ten., Bar. Soli; SATB Choir, Children’s Choir; 1(dbl. Piccolo) 1 1 1 – 1 1 1 0; Perc. Pno. Str. for Wind Ensemble 5:00 3Fl. (Fl.1 dbl. Picc. ), 2Ob., E.H., 3Cl., B.Cl., 2Bsn., Cbsn., A.Sax., T.Sax., Bar.Sax. – 4Tpt., 4Hn., 2Tbn., B.Tbn., Euph., Tu. 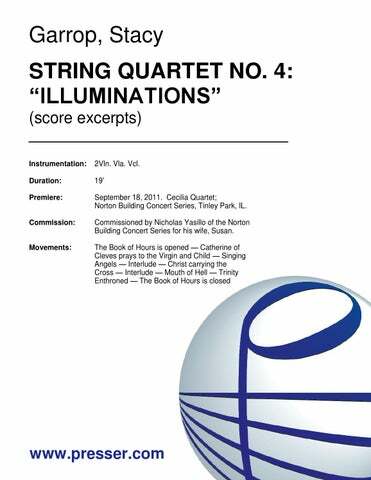 ; Timp., 4Perc. She’s got a flair for vivid orchestration and a taste for grand epic. …a distinct American style of composition, and melody always stands in the forefront of contemporary dissonances. …highly inspired. This is confident, big-boned music, scored with flair and wholly delightful. …sumptuously scored and meticulously crafted … [the] composer has a sharp ear for instrumental color and narrative form: She can tell a story. The central movement, by turns introverted and extroverted, displayed the violins in lush double stops, sometimes together, sometimes in imitation. The ebullient finale featured scampering dance rhythms and mildly spiced harmonies. In all, an enjoyable, well-made piece that played to the strengths of all three players, not least their sense of spontaneous combustion. “Glorious Mahalia” matched [gospel singer Mahalia Jackson’s] words with music that was by turns mournful, tender, jaunty, and anxious…[saying] something of lasting value about not just a social movement of a particular era, but about human dignity and a nation’s moral aspirations. “In Eleanor’s Words” is one of the most stunning song cycles that I have heard in recent years. …these are full-fledged melodic jewels that are, in my mind – and this is a bold statement – worthy to stand alongside the Twelve Songs of Emily Dickinson and Hermit Songs by Copland and Barber respectively, no mean accomplishment, and certainly not one that I utter easily. They are that good, and this is a remarkable series of vignettes that truly marry words and music into ‘art’ songs. …attractive and approachable, but not facile. This is a touching cycle of songs that bravely tackles vital questions of responsibility, both personal and governmental, that still have vital resonance today. Based on recorded evidence from two Cedille anthologies, the music of Stacy Garrop has seemed well worth following. This album, the first devoted entirely to her works, reveals both the talent and breadth promised in those earlier works. … [Eleanor] Roosevelt’s prose bubbles off the page with such natural grace that it’s to Garrop’s credit that the music is equally buoyant, shifting between narrative action and emotional reflection with quasi-operatic ease. 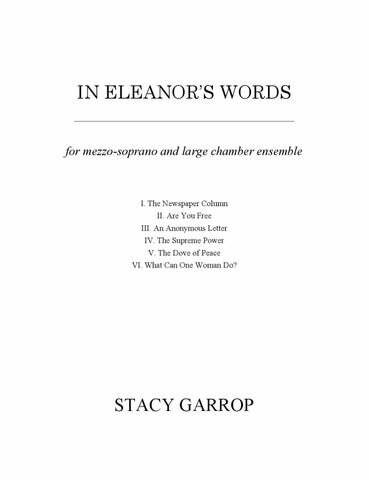 The title work, “In Eleanor’s Words,” amasses Eleanor Roosevelt newspaper columns into a work for mezzo-soprano and piano … Garrop adds plenty of drama with her music. 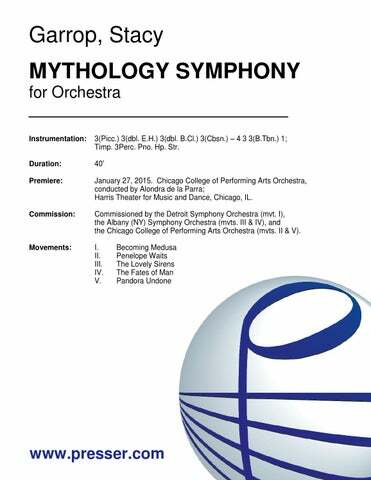 One can imagine any number of brass ensembles wanting to add this finely crafted piece to their repertory. 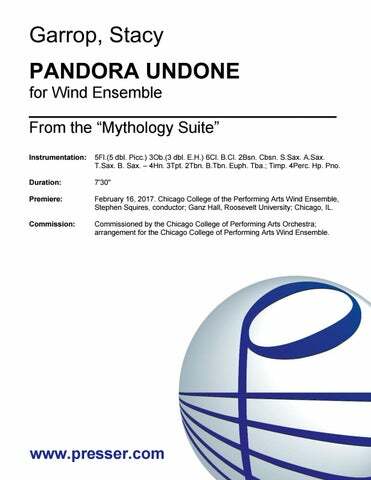 …a beautifully crafted, haunting piece. … The interplay of quiet dissonances, sharp-edged phrasing and familiar, lyrical melody was compelling. An Appalachian folk-song set in an appropriate string-playing style, the piece falls into a long line of composers, from Haydn to Bartók, who’ve harnessed popular idioms for more cultivated ends. Without sounding like any of her antecedents, Garrop has hauled their spirit into the 21st century. 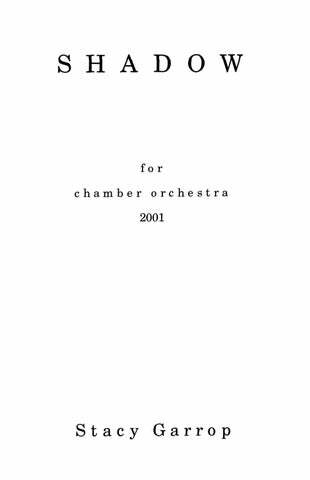 …a mini-masterpiece … the composer pulls out all the emotional stops making her quartet a stunning listening experience that must rank with some of the best chamber music being written today. This quartet is sophisticated and smartly crafted … Few composers these days match her skill at using the push and pull of harmony, in combination with great rhythmic sense, to propel music through time and control mass and momentum. And fewer can develop musical ideas as convincingly as Garrop does here. The work is a striking act of catharsis, full of fierce and yearning gestures that evoke emotional combat…Garrop masterfully weaves slicing dissonances, sliding tones, anguished melodies and haunting harmonies into her riveting narrative. The music holds harrowing episodes of disturbing musical substance, harsh, inflamed, symbolic and reflective of demons seeking control. In contrast, there, too, are haunting, luminous passages of angelic calm, suggestive of healing moments. Garrop has successfully, inventively, potently recreated a mind at war with itself. …attempting to portray nothing less than the creation of the world, her musical audacity has much to admire. …Garrop knows where and how to place strings for maximum impact. …an intense…yet brilliant composition of a Greek creation myth. …her powerful Third String Quartet (“Gaia”)…takes its inspiration and primal energies from the Greek earth-goddess, provides the Biava Quartet with an ideal outlet for its youthful vibrancy. The concert turned up a strong front runner in Garrop’s “Thunderwalker” … Cast in three sections, this is a big, bold tour de force for large symphony orchestra that seizes your attention at once and refuses to let go. 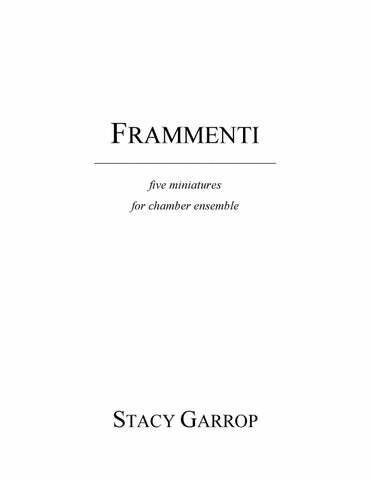 Garrop knows her modernist antecedents but she also knows how to deploy a large, colorful orchestra confidently, indeed audaciously, lashing her ritualistic rhythms forward in a manner that leaves both the orchestra and audience exhilarated. Given the furious speed with which Garrop’s ideas rush by, one was grateful to be able to hear the piece a second time. 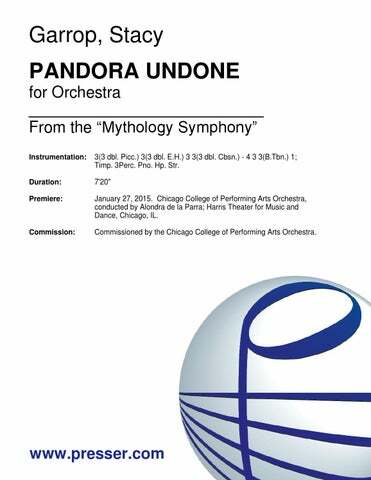 I hope the CSO eventually takes it up, for it deserves wide circulation. “Thunderwalker”…crackled with energy and vitality. Its performance on this occasion demonstrated that Ms. Garrop is a skillful composer with an interesting message and all the necessary means to convey this message in a meaningful and effective manner … Ms. Garrop’s clever use of instrumentation added immeasurably to the effectiveness of the score. Her writing for strings, winds and percussion, and especially the excellent piano effects demonstrated a high level of mastery and artistry. Ms. Garrop is sending us a message that contemporary music is alive and well, and the message came through strong and clear. 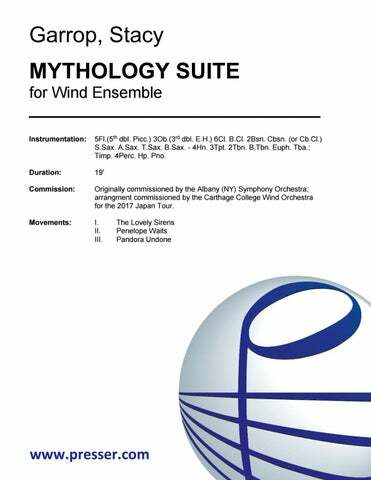 A blend of old and new styles, this bracing work uses dissonance and instrumental effects such as flute flutter tonguing, muted violins and altered piano tones for dramatic emphasis. [The director] had filled in the audience with details of the titled Thunderwalker’s activities, but this music can stand on its own. The work that emerged as the most significant was Garrop’s aptly named “Thunderwalker.” In three movements following classical style — a fugue, a passacaglia, and a scherzo and trio — her music is all about primitive rituals… [it] started thunderously, with a frightening clatter of percussion and timpani and continued to build. 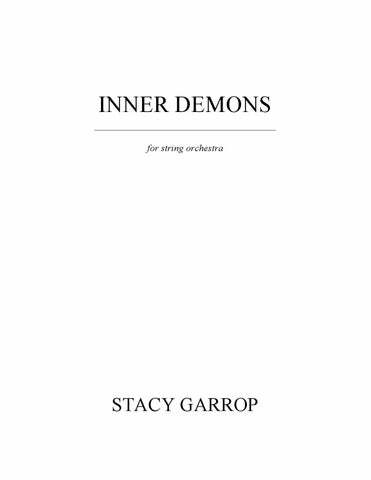 Garrop’s orchestration was inventive and fascinating… Stacy Garrop’s music stretched the imagination and she is the one I would like most to hear from in the future. “Thunderwalker” shines in concert … The overall impression was of something bracing, highly colored, strongly motivated… You could imagine an idealized kind of opening-credits music from Hollywood’s golden days sounding the way “Thunderwalker” does. But in this case it wasn’t Bernard Hermann composing it, but Stacy Garrop.